Johanna Rusanen-Kartano began her vocal studies at the Sibelius Academy in Helsinki and undertook additional training in Berlin and Vienna. 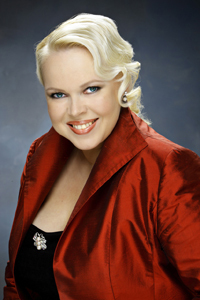 In 1995, she won the Timo Mustakallio Singing Competition and the Lappeenranta National Singing Competition in 1996. Johanna Rusanen-Kartano was awarded a scholarship by the Deutsche Oper Berlin in 1998-2000, and in 2001 she won the Karita Mattila prize. Rusanen-Kartano's operatic career was launched at the Kuopio Opera in 1994, and since then she has performed regularly at the Savonlinna Opera Festival, the Deutsche Oper Berlin, the Finnish National Opera, Vantaa Opera, Opera Cava and Oulu Opera. Her roles have included Marie in Wozzeck, Tatiana in Eugene Onegin, Marguerite in Faust, Lauretta in Gianni Schicchi, Ortlinde in Die Walküre, the First Lady in Die Zauberflöte, Donna Elvira in Don Giovanni, Mimi in La Bohème, the High Priestess in Aida and Amelia in Un ballo in maschera. She enraptured audiences in her last role as Tatiana in Central Finland Regional Opera's production of Tchaikovsky's opera Eugene Onegin in January 2007. Johanna Rusanen-Kartano has gained a reputation as an interpreter of strong female roles in Finnish operas. She is remembered for her performance of the main female role in Tuomas Kantelinen's opera Paavo Suuri at the Helsinki Olympic Stadium and for the role of Anna in Aulis Sallinen's opera Ratsumies (the Horseman), which was performed at the Savonlinna Opera Festival in 2005–2006. Johanna Rusanen-Kartano is in demand as an orchestral and oratorio soloist, and she has also given lied concerts in Japan, Chile, the USA and North Korea, in addition to many European countries. Her versatile repertoire also includes lighter music, such as operetta, musical and film music, as well as jazz standards.